It’s not an overstatement to say Major Millions, like David Attenborough, Michael Palin and Chico, is a de facto national treasure. As old-school as Sandhurst itself, this classic military-themed slot from Microgaming is straightforward to play and drops progressive jackpot rewards the size of Howitzer rounds. So, look lively soldier, and FALL IN. 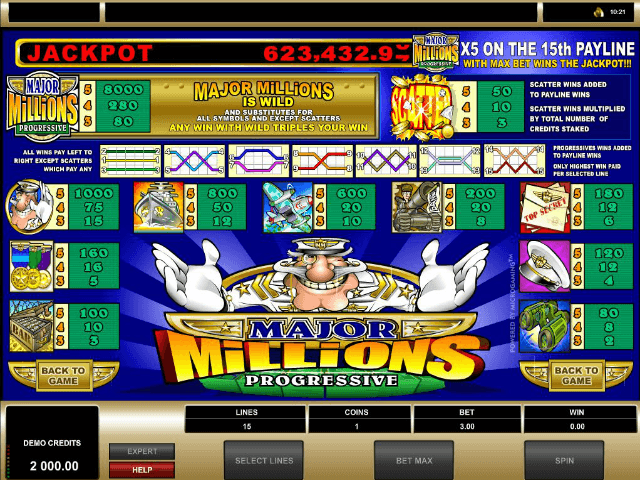 Play Major Millions Slot Demo for Free! 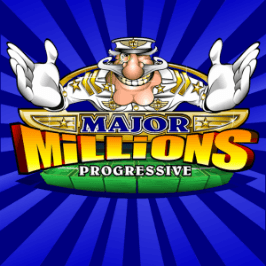 Play Major Millions for Real Money! Like the eponymous Major himself, this revered old five-reel, 15-payline slot looks dated yet distinctly cheerful. This cheer may be based on the fact that, despite the game’s age (it was first unveiled way back in 2000), it maintains a progressive jackpot which has the potential to deploy payloads equal to the Mother of all Bombs. No kidding, the average winning bounty is close to the £400,000 mark, while the big ‘once in a blue moon’ wins — which occur roughly every three months — can be double that. One lucky gamer in Europe even landed an incredible jackpot of £1.4 million once. And all for just £0.20 - £3.00 a spin. Being a distinctly old-school type of chap, the Major doesn’t go in for all those low-value playing card symbols on his game’s reels. He prefers his symbols to have a jolly good military theme. You’ll find things like the Major’s cap, binoculars, some medals, an ammunition box, some secret documents, a tank, a fighter plane, a warship and the Major himself whizzing around the Major Millions slot. The symbols to keep an eye out for are the Major Millions logo (the game’s wild) and a big explosion, which is the scatter. As you’d expect, the wild substitutes for everything except the scatter. Create a winning payline with a wild and you’ll triple the amount you’d ordinarily win. If you’re lucky enough to land three wilds across a payline then you’ll automatically win 80 coins. Bag four and that rises to 280. 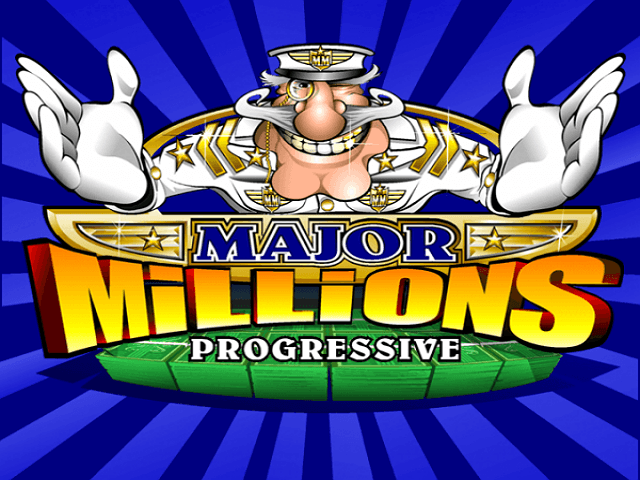 Get five of the blighters to line up for parade across the first 14 paylines and you’ll net Major Miilions’ biggest base-game jackpot of 8,000 coins. Landing scatter symbols anywhere across the reels earns rewards, although you need three or more to pop up to get a cash prize. All scatter wins get added to any other payline wins you might have accrued and are multiplied by the total number of credits you staked on that particular spin. The wild symbol is the key to winning the really big bucks on offer in the Major Millions online slot’s progressive jackpot. 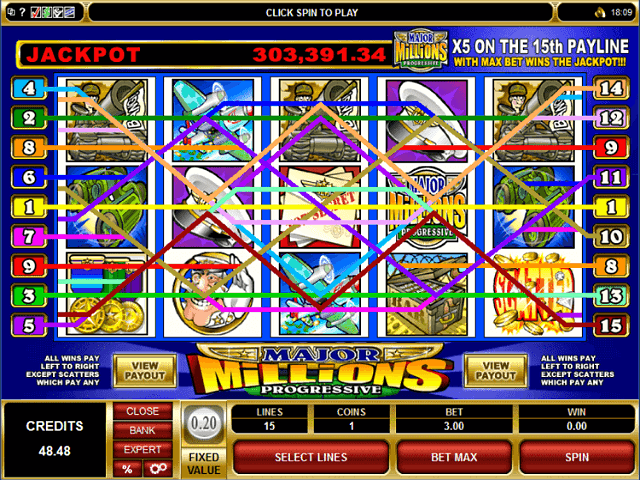 If you’re lucky enough to land five of them on payline fifteen (the one that starts with the symbol in the bottom left-hand corner then zig-zags across to finish in the lower right-hand corner) then the MOAB jackpot total shown above the reels will be all yours. This is likely to be very considerable indeed so you should be prepared for some serious shock and awe. Fun to be involved with, simple to play, and packing a jackpot that even Kim Jong-Un would be intimidated by, Major Millions continues to pull in eager recruits by the bucket load. Well worth signing up for. Share this Major Millions Review today! 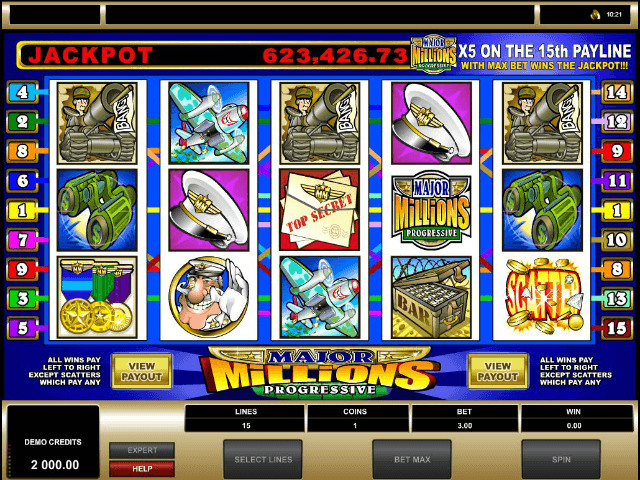 If you like Major Millions, you'll love these slot titles too!